With each successive model year, the second-generation Mazda CX-9 has benefited from refinements, technology updates and performance improvements. 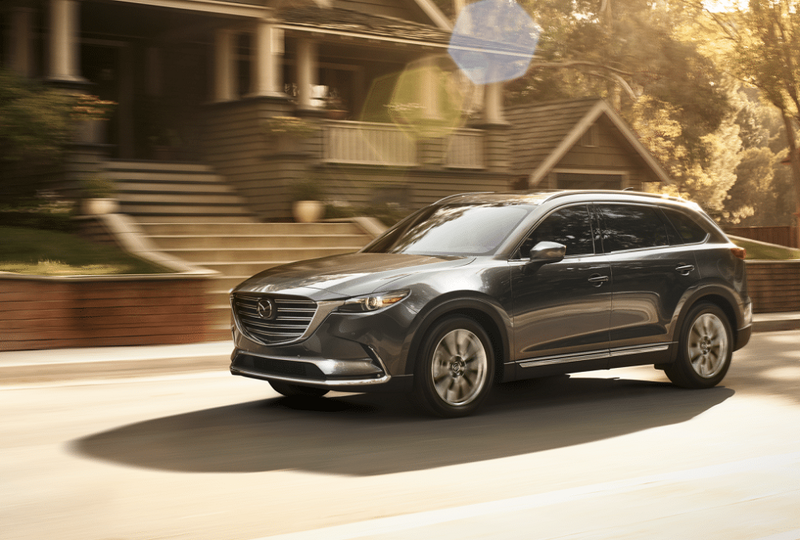 The 2019 Mazda CX-9 is no different, with a host of improvements led by the addition of factory-equipped Apple CarPlay and Android Auto infotainment technologies as standard equipment in Touring trim level and above. Mazda’s engineers could have left well enough alone for their award-winning family vehicle but instead continue to make meaningful improvements to benefit drivers and passengers in all three rows. Among the updates are a refined, retuned suspension that offers a smoother, quieter and more natural ride and greater sound suppression by way of a thicker headliner and thicker floor mats, which aid in ease of conversation and enjoyment. The entry CX-9 Sport continues to offer strong value, with standard 18-inch alloy wheels, 7-inch MAZDA CONNECT infotainment screen with revised Commander control knob, cloth seats, LED headlights and tail lights, one-touch front and rear power windows, rear privacy glass, three-zone automatic climate control, Bluetooth hands-free phone and audio pairing, keyless entry and push-button start, Smart City Brake Support automatic emergency braking, Blind Spot Monitoring with Rear Cross-Traffic Alert. Available for the CX-9 Sport is the Sport Package that includes a power driver’s seat, heated front seats, heated door mirrors, automatic headlights, High Beam Control, Lane-Keep Assist, Lane-Departure Warning, full-speed Mazda Radar Cruise Control, rain-sensing wipers and Smart Brake Support automatic emergency braking. Upgrading from the CX-9 Sport to the CX-9 Touring adds standard automatic headlights, heated front side mirrors, power liftgate with adjustable height, rain-sensing windshield wipers, leather-trimmed seating surfaces, Mazda Advanced Keyless Entry, a power driver’s seat, 8-inch MAZDA CONNECT infotainment screen, two second-row USB ports (each 2.1 amps), HomeLink, High Beam Control, Lane-Keep Assist, Lane-Departure Warning, full-speed Mazda Radar Cruise Control, Smart Brake Support and Smart City Brake Support with Pedestrian Detection. New-for-2019 Mazda CX-9 Touring features include factory-installed Android Auto and Apple CarPlay infotainment technologies and a frameless auto-dimming rearview mirror. Optionally available, the CX-9 Touring’s Premium Package equips the three-row crossover SUV with a power moonroof, BOSE Premium 12-speaker audio system, SiriusXM with a three-month trial subscription, LED fog lamps, Mazda Navigation, front parking sensors and a second-row retractable sunshades. New for 2019, SiriusXM also comes with SiriusXM Travel Link Services, which enables live traffic updates, weather, sports scores, fuel prices and nearby parking information. The CX-9 Grand Touring builds upon those features and adds a new 7-inch TFT reconfigurable gauge cluster display first seen in the 2018 Mazda6 midsize sedan, ventilated front seats, new power-folding door mirrors and a new 360° View Monitor. These new features supplement the CX-9 Grand Touring’s standard Adaptive Front-lighting System, chrome exterior accents, roof rails, windshield wipers de-icer, 20-inch aluminum alloy wheels, Active Driving Display with Traffic Sign Recognition, heated steering wheel, LED door-pocket and overhead illumination and front and rear parking sensors. The CX-9 Signature represents the flagship of the range with new rear exterior badging, LED grille accent lighting, Auburn Nappa leather seating surfaces, a hand-stitched, leather-wrapped “chidori” steering wheel, new Santos rosewood interior trim and supplemental interior lighting around the transmission shifter. All Mazda CX-9 models come equipped with an innovative, award-winning SkyActiv-G 2.5T turbocharged engine that delivers up to 250 hp on 93-octane gas (227 hp with 87-octane gasoline) and a robust 310 lb-ft of torque independent of fuel octane. All CX-9 models route power through a six-speed SkyActiv-Drive automatic transmission. Mazda’s predictive i-Activ all-wheel drive is standard in the CX-9 Signature and available with all other trim levels. Mazda’s i-Activ all-wheel drive uses 27 sensors throughout the vehicle to paint a picture of road conditions and is designed to route power from the front to rear wheels and vice versa so the driver and passengers do not feel wheelslip. It can adjust more than 200 times per second. The 2019 Mazda CX-9 will begin arrive in select dealerships in the U.S. this month and will be in dealerships nationwide in September.